이 상은 윤왕좌(輪王坐)의 보살상으로 금동불로는 규모가 비교적 큰 편이다. 보살상의 세부 표현과 양식은 전반적으로 고려시대의 특징을 잘 계승하고 있으나, 타원형의 양감있는 얼굴모습, 유두를 두드러지게 표현한 점, 몸 전면에 영락이 표현되지 않은 점, 몸을 감고 있는 천의자락의 선이 경직되게 표현된 점 등은 조선전기의 특징으로 여겨진다. 이 보살상은 조선 전반기의 금동상으로서 규모가 큰 편이고 보관 등에 다소 파손된 부분이 있으나 전체적으로 원래의 모습을 잘 보존하고 있다. 또한 이와 같이 크기가 큰 윤왕좌의 보살상은 조선 전기 보살상 중에서는 그 예가 드물며, 신체의 균형이 좋으며 자연스럽게 처리된 옷 주름 등 조각기법이 매우 우수한 금동보살상이다. This Gilt-bronze Seated Avalokitesvara Bodhisattva in the posture of the Wheel-turning King is nicely proportioned and skillfully carved, with the robe naturally depicted. 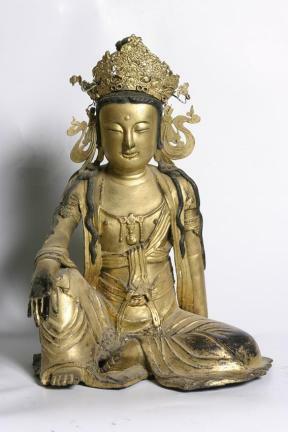 It is also unusually large among gilt-bronze bodhisattva images with a similar posture, resting the right hand on the raised right knee with the left leg flat on the floor, dated to the early Joseon Dynasty. The image inherits characteristic features of the Goryeo Dynasty in overall style as well as detailed expression. But the elongated yet slightly swollen face, the prominent whorl of white hair on the forehead, and the more or less rigid lines of the robe with few beaded accessories are regarded as influences of early Joseon. The Image is relatively well preserved, though with minor damage on the crown.